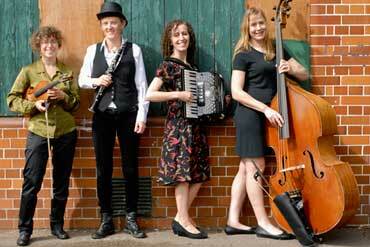 An afternoon of toe-tapping klezmer music! 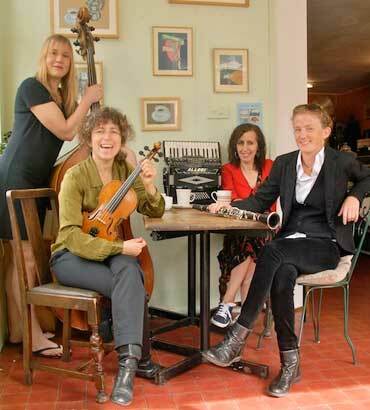 The London Klezmer Quartet is a dynamic all-female group of performers whose deep understanding of klezmer, the celebratory & soulful music of Eastern European Jews, is reflected in exuberant, passionate & accomplished performances that captivate audiences of all ages & backgrounds. Take advantage of this unique opportunity to experience this amazing ensemble unplugged in the glorious acoustics of Humph Hall! Visit their web site. Watch YouTube clips from their 2014 concert in Humph Hall. Call or email Wayne (02) 9939 8802 to reserve your seat. 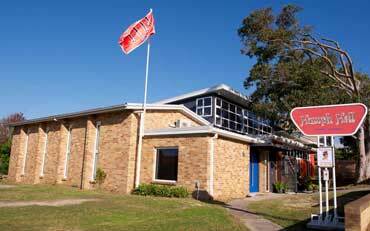 Formerly the Allambie Heights Uniting Church, Humph Hall is now the private home of Gial Leslie and Wayne Richmond. 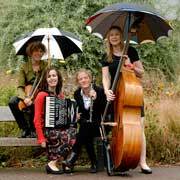 As with all concerts in Humph Hall, the London Klezmer Quartet will perform acoustically - no PA system! This all femaie plays old and new traditional material guaranteed to move audiences from toe-tapping to tears and back again in moments.